It’s not even Thanksgiving yet but we know that some of you already have shopping on the brain. To find local and eco-friendly gifts for the holidays, consider stopping by the Downtown Holiday Market, which opens on December 4, 2009. The market runs from noon to 8:00pm through December 23, 2009 and is produced by the Downtown DC Business Improvement District and Diverse Markets Management. Jenafusion (VA) – Handcrafted fashion accessories made from recycled, reclaimed, vintage, and new material. Products include hats, purses, scarves and wallets. The Devil Made Me Do It (MD) – One-of-a-kind clothing from 99% “upcycled” materials. The Red Persimmon (MD) – Fair trade and handmade gifts from India, Bali, Uganda, Mexico. Items include clothing, linens, silk and cotton purses, ornaments, and accessories. Three Stone Steps (MD) – Eco-friendly and fair trade accessories imported from Cambodia, Vietnam, the Philippines, and Haiti. Products include bags, wallets, silk scarves, and jewelry. Guata-Java (MD) – Specialty fair trade, organic Guatemalan coffee. 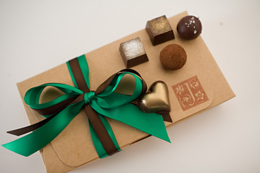 J. Chocolatier (DC) – Handmade luxury truffles and buttery caramels. Tea Co (VA) – Organic loose leaf teas and tea wares. Terre de Provence (MD) – Specialty olive oil.